Amphibians of North Africa is a comprehensive compilation of available data on the amphibians and reptiles found in various ecosystems across North West Africa and parts of the Mediterranean region. It is essential to identifying and understanding the ecological role of regional herpetofauna and its conservational importance. It examines the biological origins and diversity of amphibians in North Africa, along with their diverse ecosystems, including deserts, grasslands and subtropical forests. The book features detailed descriptions of the adult and larvae stages of species, such as the North African fire salamander, the common painted frog, Brongersma's toad and the Mediterranean tree frog. 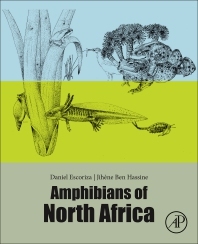 This book is a vital resource for herpetology and ecology students and researchers, helping them identify, understand and conserve these amphibians and reptiles in their various habitats across the North African and Mediterranean regions. Daniel Escoriza is a physician and researcher for Institut Català de la Salut and University of Abdelmalek Essaâdi. His work now focuses on the ecology of Mediterranean amphibians, particularly in North African species. Before coming to ICS/AEU, D. Escoriza collaborated with the University of Girona. He has published about 50 articles in scientific journals and three books, describing one new genus and two new subspecies of North African amphibians and a new species of freshwater shrimp. Daniel Escoriza earned a doctorate in ecology from the University of Girona. He is also member of the IUCN working group in Mediterranean amphibians. Dr. Jihène Ben Hassine is a teacher and biologist for University of Tunis el Manar. Her work now focuses on the ecology of North African amphibians, with special interest in Algeria and Tunisia. She has published about 25 articles in scientific journals. Jihène Ben Hassine earned a doctorate in ecology from the University of Tunis el Manar.